St. Martin's Press, 9781250089649, 336pp. In the late 19th and early 20th centuries, the Democratic Party was bitterly split between its urban machines—representing Catholics and Jews, ironworkers and seamstresses, from the tenements of the northeast and Midwest—and its populists and patricians, rooted in the soil and the Scriptures, enforcers of cultural, political, and religious norms. The chasm between the two factions seemed unbridgeable. 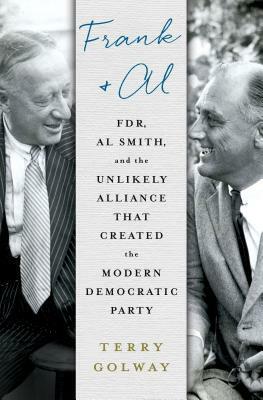 But just before the Roaring Twenties, Al Smith, a proud son of the Tammany Hall political machine, and Franklin Roosevelt, a country squire, formed an unlikely alliance that transformed the Democratic Party. Smith and FDR dominated politics in the most-powerful state in the union for a quarter-century, and in 1932 they ran against each other for the Democratic presidential nomination, setting off one of the great feuds in American history. The relationship between Smith and Roosevelt, portrayed in Terry Golway's Frank and Al, is one of the most dramatic untold stories of early 20th Century American politics. It was Roosevelt who said once that everything he sought to do in the New Deal had been done in New York under Al Smith when he was governor in the 1920s. It was Smith who persuaded a reluctant Roosevelt to run for governor in 1928, setting the stage for FDR’s dramatic comeback after contracting polio in 1921. They took their party, and American politics, out of the 19th Century and created a place in civic life for the New America of the 20th Century. TERRY GOLWAY is a senior editor at POLITICO and the author of several works of history, including Frank and Aland Machine Made. He has been a columnist and city editor at the New York Observer, a member of the editorial board of the New York Times, and a columnist for the Irish Echo. He holds a Ph.D. in U.S. History from Rutgers University and has taught at the New School, New York University, and Kean University.